TEMPLE MOUNT WATCH: Here are some of the latest reports and editorials on the Mugrabi Gate-bridge excavation. JERUSALEM - Israeli riot police hurling stun grenades fought crowds of stone-throwing Palestinians outside Al Aqsa Mosque, Islam's third-holiest shrine, Friday in a clash triggered by Israeli excavations near the site that have drawn sharp condemnations across the Arab world. The confrontation after Friday prayers, beamed live across the Middle East by satellite news channels, ended with no serious injuries, but it raised concerns that the protests could spread to the West Bank and Gaza Strip and inflame religious passions throughout the region. The Israeli excavation, in preparation for construction of a new approach ramp for visitors to the hilltop compound known to Muslims as the Noble Sanctuary and to Jews as the Temple Mount, has become the latest flashpoint of the struggle for the contested area - ground zero of the Arab-Israeli conflict. Jordan's King Abdullah II on Friday condemned what he called Israel's "violations" against protestors at Jerusalem's Temple Mount compound, and warned such practices would only enhance violence and place "obstacles" in the path of peace. "Jordan will push ahead with Arab and Islamic contacts as well as on the international level to ensure that Israel halts such deeds, which only lead to the expansion of the violence cycle and places obstacles versus efforts aimed at re-launching the peace process," Abdullah told Palestinian Authority Chairman Mahmoud Abbas in a telephone conversation, a royal court statement said. "The King expressed concerns over the dangerous Israeli escalation against the Islamic holy places and rejected all pretexts cited by Israel as a cover-up for its violations of al-Aksa Mosque," it added. Meanwhile, in an interview with Israel Radio on Friday morning, archaeologist Meir Ben Dov, who headed previous excavation work at the Temple Mount site, said there was no need for the renovations to be carried out at the Mughrabi Gate and that the planned bridge was not required. Ben Dov added that the excavations near the Temple Mount were illegal and that Israel had not received the required permits. JERUSALEM, Feb. 9 (UPI) -- Clashes at one of the world's holiest sites between stone-throwing Muslim demonstrators and Israeli policemen in heavy riot gear Friday ended with 30 injuries and fears it could be a harbinger of something far worse. Most of the fighting was on a plaza the Jews call the Temple Mount, their holiest site, and the Muslims al-Aqsa, their third holiest site. The dispute was over excavations the Israelis launched along a ramp leading to the plaza's southwestern Moors' Gate. Part of that ramp collapsed following an earthquake and snowstorms in 2004. The Israelis built a wooden bridge nearby and sought to replace it with something sturdier. They launched "salvage excavations," an archaeological procedure designed "to prevent and minimize damage which could be caused to ancient remains as a result of the construction," the Israel Antiquities Authority said. These excavations will not extend to the Temple Mount's wall, the authority's spokeswoman Osnat Gouez said. The Waqf that manages the al-Aqsa compound protested the excavations and Muslims repeated charges that Israel was threatening their mosques. "No one moves a stone here without a political consideration," argued Arab Knesset Member Talab al-Sana. "The conspiracies regarding al-Aqsa have not ceased" and, "of course" Israel was digging under the mosques. Witness a big lie in the making! If you follow the news carefully over the next couple of weeks you will be able to witness the careful and delicate work of creating a false new "reality". What began as an attempt to rebuild a damaged ramp leading to the Mughrabi gate has escalated into an international incident. The work is proceeding near a temporary walkway that replaces a centuries-old stairway which collapsed during storms in 2004. The Israeli authorities have explained that the renovations are needed to safeguard the ancient site and have told all the critics that there will be no structural damage to the ancient site or to the Temple Mount beside it. Amid the old city of Jerusalem and rising above it is the ancient site of Solomon's Temple and the point from which the Prophet Mohammed journeyed to Heaven. Holy to Jews and Muslims, it is as dangerous these days as a ticking atom bomb. Any readjustment of its ancient stones can detonate outrage among millions of faithful around the world. On Friday, Muslims in Jerusalem protested against Israeli excavation work next to al-Aqsa, one of Islam's holiest shrines, which sits atop the site. Around the world, Muslims declared a universal "day of anger," Israeli police stormed into the Muslim compound and fired stun grenades and rubber bullets at youths trying to hurl stones at Jewish worshippers at the Western Wall. Israeli police claim that 17 protesters and 15 police officers were injured in the clashes, but Palestinians say many more were hurt in skirmishes around the mosque grounds. Muslims also say that the excavations will also be destroying chunks of their religious heritage, but Israeli archeologists and Palestinian workers on the site are clearing away every stone and pottery fragment with the precision of surgeons. Not that it matters. Throughout the Muslim world, the Israeli excavations adjacent to al-Aqsa are being portrayed as sacrilege, as another blow by Israel and, indirectly, by its ally America, against Islam. For the last three days, the story has topped headlines and news broadcasts throughout the Muslim world. Other articles are pouring in faster than I can keep track of them, but this should give you the general idea. I* 1947 one of the most significant discoveries of the 20th century was made by three Bedouin boys playing in the caves above the Dead Sea in Israel. During their explorations they discovered a treasure, scrolls, dating from before A.D. 100. Adolfo Roitman, curator of the Dead Sea Scrolls and director of Jerusalem's Israel Museum Shrine of the Book, will lecture locally on the religious significance of these scrolls to both Judaism and Christianity. Clashes erupted today at Jerusalem’s Al-Aqsa mosque compound - the Holy Land’s most contested religious site - between Palestinian stone throwers and Israeli police who fired off stun grenades. Police officers and rioters were wounded, a police spokesman said, in troubles that flared after Muslim leaders called for a “day of anger” to protest against Israeli public works that they charge endangers the holy site. Explosions from stun grenades, bursts of smoke and shouting could be heard at the esplanade of the compound, which is venerated by Muslims as the third holiest site in Islam, and by Jews as the Temple Mount. Reports suggested that as many as 300 protesters had holed up in the mosque. Also, this BBC article has a diagram of the area (scroll down). So how can the Muslim world be awash in violent threats based on an entirely fabricated pretext? Must there not be something to it? The answer is that Muslim indignation is taken as self-justifying, and the more violent it is, the more the Western victims of it tend to question themselves. Radical Islamist intimidation tactics will continue to multiply if the West, including Israel, does not show minimal respect for itself and the truth. Western condemnation of extremist threats should be swift, universal, and unequivocal. This time the victim happens to be Israel; next time it could be anywhere else. Both worth reading in full. A clandestine sect with evil plans to end the world. An ancient code. Secret saints. And the Kabbalah. These are the key elements of "The Book of Names," a new spiritual thriller that has been flying off the shelves since its release last month. The book, co-written by Chicago native Jill Gregory and her best friend/writing partner Karen Tintori, was released Jan. 9 with a first printing of 75,000 copies and already has gone into its second printing, Craig Libman, a publicist for St. Martin's Press, said. The foreign publishing rights for "The Book of Names" have been sold in 16 countries, and in Germany, where the book was published as "Das Buch der Namen" in December, it is No. 14 on the bestseller list and has sold more than 155,000 copies. As the Economist newspaper in London put it in a headline that accompanied a glowing review of "The Book of Names": "Watch out Dan Brown." The plot turns on a legend from the Talmud that says in every generation, the fate of the world rests in the hands of 36 righteous people known as lamed vovniks or "hidden ones." These people don't know they are one of the chosen, and neither does anyone else. The lamed vovniks just go about their everyday lives, doing what is right and good and keeping the rest of the world from God's wrath. In "The Book of Names," a (fictional) nefarious offshoot sect of the ancient Gnostic tradition known as the Gnoseos has learned the identities of 33 of 36 lamed vovniks and has set about assassinating them to hasten the end of the world. Through plot murder-mystery-meets-mysticism plot twists, the book's hero, a political science professor named David Shepherd, uncovers the Gnoseos' plans and also realizes that his young stepdaughter is one of the remaining three lamed vovniks the Gnoseos - whose members include heads of state and other luminati - are systematically murdering. With the help of Yael HarPaz, a fetching Israeli archeologist -Shepherd sets about saving his stepdaughter and the rest of the world by unraveling codes based on gematria, numerology applied to the Hebrew alphabet. Sounds like fun, although it's probably also unbearably silly. Ther term lamed vovniks looks Yiddish rather than Talmudic, and I don't know where they come from, if from anywhere outside the imagination of the authors. There weren't any Gnostic groups called the "Gnoseos." The word is just the genitive case of the Greek word gnosis. But in terms of the Dan Brown comparison, the important think is that Gregory and Tintori seem not to be making any outlandish historical claims about their novel. I don't know a lot about this, but the Talmud San. 97b has a statement that there must always be 36 righteous in the world who see the divine presence. Gershom Scholem has a fine essay translated from German in The Messianic Idea in Judaism and Other Essays on Jewish Spirituality, "The Tradition of the Thirty-Six Hidden Just Men." And an earlier novel to use this tradition is The Last of the Just, by Andre Schwartz-Bart. The phrase "lamed-vav" is just the number 36 written in Hebrew letters. So that much seems to come from the Talmud. Another comment on your blog entry about "The Book of Names" -- This is not the first work of popular literature to be written on the theme of the 36 Just Men. Stephen Bilias' book "The Quest for the 36" is a work of speculative fiction from 1988. I bought it by chance back then and really enjoyed it. Far from "Da Vinci Code"-esque thrillers, it is a work of seriocomic speculative fiction, about a New York talent agent (to give you a sense of the humor of the thing, his name is Dexter Sinister) who is recruited to find the Lamed-vov. In the end it is surprisingly touching, actually. I found it delightful. UPDATE (15 February): The authors respond. THE OLD TESTAMENT PSEUDEPIGRAPHA BLOG has now opened. I'll be posting the first lecture this afternoon. THE INFANCY GOSPEL OF THOMAS MEETS YOUTUBE. UPDATE: And in case you still need to learn Coptic, there's this. The supreme leader of Iran has called on Islamic nations to retaliate against Israel over excavations being carried out near a hotly disputed holy site in Jerusalem. Ayatollah Ali Khamenei did not say what sort of response he intended, but he said the Islamic world should make Israel “regret” what it is doing. Police today scuffled with an Israeli Islamic leader and several of his followers near the site where Muslims have been protesting against excavations and repairs. Raed Salah, the fiery leader of the Islamic Movement in Israel, and six supporters were taken for questioning after “a brawl” with police guarding work near the hilltop compound known to Jews as the Temple Mount and to Muslims as the Noble Sanctuary, home of the Al Aqsa mosque complex, police spokesman Micky Rosenfeld said. It wasn’t clear whether charges would be brought, Rosenfeld said. Three Palestinian youths were questioned on suspicion of throwing stones at an Israeli bus near the Old City, but there was no other trouble reported this morning, he added. JERUSALEM (Reuters) - Israeli Prime Minister Ehud Olmert has spurned an appeal from his defense minister to halt excavation work near Jerusalem's most important holy site, the Haaretz daily said on Thursday. Tensions have flared between Israel and the Palestinians over the start of an Israeli excavation near a compound housing al-Aqsa mosque in Jerusalem, Islam's third holiest site. Arab states have asked Israel to halt the work, which began on Tuesday, saying it could damage the mosque's foundations. Palestinians said a ceasefire in Gaza with the Jewish state might unravel if the work continued. "A thorough examination of the matter would reveal that nothing about the work underway will harm anyone, and there is no truth in the contentions against the work," the newspaper quoted Olmert's office as saying in rejecting a written appeal from Defense Minister Amir Peretz. As the structural work near the Temple Mount drew protests from around the Arab world, Israeli archeologists complained Wednesday that the government was not doing enough to protect Jewish artifacts from building work by the Muslim Waqf, which controls the Temple Mount. "The Waqf has acted terribly, taking thousands of tons of artifacts from the First Temple, the Second Temple, as well as Muslim artifacts, and throwing them away," Dr Eilat Mazor, from the Hebrew University, told Ynetnews. "They want to turn the whole of the Temple Mount into a mosque for Muslims only. They don't care about the artifacts or heritage on the site." She added that there was a link between routine denials of the existence of the Jerusalem Temples by senior officials of the Palestinian Authority, and the way the Waqf was treating artifacts on the site. It is worth mentioning, for those who have forgotten and those who would like to make others forget, that the situation that prevails at the Temple Mount and the Western Wall plaza is based on a quite stable status quo that has been in place for 40 years. David Ben-Gurion described the situation in June 1967 by saying: "The Western Wall is for the Jews at the moment, and the Temple Mount is for the Muslims at the moment, and that is the reality we have to accept." At the same time, Moshe Dayan determined that the Mugrabi Gate would remain in Israel's exclusive control, to prevent the Muslim authorities from having the ability to unilaterally close all the gates to the Temple Mount. The construction of the bridge from the Western Wall plaza to the Mugrabi Gate is therefore a crucial Israeli interest, which even the Waqf authorities do not deny, and it is part of the status quo. The incitement against the construction of the bridge is a clear attempt to undercut the status quo. Therefore, it must not influence the authorities' decision to replace the temporary bridge. The activity of the security forces, which ensures that the work is carried out, deserves full support. All the same, we must remember that the status quo applies not only to the Western Wall plaza, but also to the Temple Mount. For that reason, those who contemptuously reject the charge that the foundations of the Al-Aqsa Mosque are being damaged must also react with the same derision toward attempts by Jewish zealots to change the situation at the Temple Mount or incite against the Muslim Waqf. The situation in the Temple Mount area must be dealt with with sensitivity and intelligence - but also with resolution, to safeguard crucial Israeli interests that were determined two generations ago and retain their validity to this day. UPDATE: See also the the updates to this post from a few days ago from people unhappy with the coverage by Haaretz. Todd Bolen's rule of thumb has a lot to be said for it. A JEWISH MUSEUM IN CAIRO? Cairo, 7 Feb. (AKI) - Egyptian foreign minister Ahmed Aboul Gheit has asked culture officials to review a project to build a Jewish history museum in Cairo, the capital of the mostly Muslim North African country. The director of Egypt's supreme council for antiquities Zaki Hawass has been tasked to look into the project, according to a report in the independent daily al-Masri al-Yom. The proposal for the museum, which includes the restoration of Jewish artifacts and other historical objects, was presented to Gheit by an "American Jewish rabbi", al-Masri al-Yom said without naming the rabbi. Cairo's ancient Shaar Hasaimaim synagogue is the proposed site for the museum, while money for its construction as well as the restoration work could be raised through an international fund-raising campaign, the report said. ADOLFO ROITMAN, curator of the Shrine of the Book, is interviewed about the Dead Sea Scrolls by the Canadian Jewish News. While scholars have put forth various assessments for the location of the Second Temple in Jerusalem, a Hebrew University of Jerusalem professor says that archaeological remains that have so far been ignored by scholars point to the exact location, which is in a spot that differs from prevailing opinion. The location identified by Prof. Joseph Patrich of the Hebrew University Institute of Archaeology places the Temple and its corresponding courtyards, chambers and gates in a more southeasterly and diagonal frame of reference than have earlier scholars. In spotting the Temple in this way, Patrich concludes that the rock, over which the Dome of the Rock mosque was built in the 7th century C.E. is outside the confines of the Temple. The rock is considered by Moslems to be the spot from which Muhammad ascended to heaven and for Jews the place at which the binding of Isaac took place. Patrich basis his proposal on a study of a large underground cistern on the Temple Mount that was mapped by British engineer Sir Charles Wilson in 1866 on behalf of the Palestine Exploration Fund. The giant cistern, 4.5 meters wide and 54 meters long, lay near the southeastern corner of the upper platform of the Temple Mount. It had a southeasterly orientation with branches extending north and south. Examining the location and configuration of the cistern together with descriptions of the daily rite in the Temple and its surroundings found in the Mishna (the Rabbinic Oral Tradition compiled in the 3rd century C.E. ), Patrich has demonstrated that this cistern is the only one found on the Temple Mount that can tie in with the Mishna text describing elements involved in the daily purification and sacrificial duties carried out by the priests on the altar in the Temple courtyard. On this basis, he says, one can “reconstruct” the placement of the laver (a large basin) that was used by the priests for their ritual washing, with the water being drawn by a waterwheel mechanism from the cistern. After this purification, the priests ascended the nearby ramp to the sacrificial altar. By thus locating the laver, the water wheel, the ramp and the altar, one can then finally map, again in coordination with the Mishna, the alignment of the Temple itself and its gates and chambers. 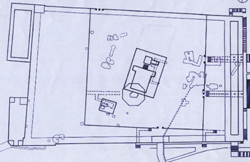 All of these considerations have led Patrich to come up with a diagram of the Temple and its surroundings that place the Temple further to the east and south than earlier thought and at a southeasterly angle relative to the eastern wall of the Temple Mount, and not perpendicular to it, as earlier assumed. It is this placement which also leaves the rock in the Dome of the Rock outside of the Temple confines (see attached drawings and caption). Prof. Patrich stressed that his research concerning the location of the Temple is strictly academic in nature, and that political connotations should not be attributed to it. UPDATE (8 February): The Jerusalem Post has picked up the story. JERUSALEM, Feb 6 - With dozens of policemen looking on, an Israeli bulldozer began work on an archaeological excavation next to the Holy Land's most explosive religious site Tuesday, drawing Palestinian protests and condemnations from the Arab world. Muslims are angry at Israel's plan to build a new walkway up to the compound where Islamic tradition says Muhammad ascended to heaven and which Jews revere as the site of their two ancient temples. Israel says the project is needed to replace a centuries-old earthen ramp that partially collapsed in a snowstorm three years ago. Its assurances that the work would cause no harm to Islam's holy sites did little to soothe tensions. Palestinian leaders harshly condemned the project, and Palestinians clashed with Israeli forces in several areas of Jerusalem and the West Bank. No injuries were reported. "What is happening is an aggression," Mohammed Hussein, the top Muslim cleric in Jerusalem, told the Gaza Strip radio station of the Hamas militant movement. "We call on the Palestinian people to unite and unify the efforts to protect Jerusalem." The small dig is 50 yards (meters) away from the walls of the hilltop compound in Jerusalem's Old City known to Jews as the Temple Mount and to Muslims as the Noble Sanctuary. Palestinians and Israelis have clashed there in the past. The dig is meant to ensure that no important artifacts are damaged by the walkway's construction, which is expected to be completed in eight months. Such exploratory digs are required by Israeli law in the ancient city. "The construction of the bridge, located in its entirety outside the Temple Mount, has no impact on the Mount itself and certainly poses no danger to it," Israeli Prime Minister Ehud Olmert's office said. At the request of a number of colleagues I send you the Table of Contents of Aramaic Studies 4.2, which appeared recently. Abstracts are still accessible on http://as.sagepub.com, but please note that the journal will be published by Brill from now on. A full announcement will follow, but I can already give away that the journal will become cheaper (yes!). PISCATAWAY, NJ, February 6, 2007�Beth Mardutho: The Syriac Institute (http://www.bethmardutho.org) celebrates its 15th anniversary and the 10th anniversary of its journal Hugoye by launching The Syriac Digital Library, known as project eBethArk�, online at http://www.bethmardutho.org/ebetharkelib, and publishing a special issue of its peer-reviewed academic periodical Hugoye: Journal of Syriac Studies (Vol. 10, No. 1). Abstract: The 10th anniversary of Hugoye offers an opportunity to reflect briefly on the work of Syriacists who have died during these last ten years. Their contributions to the field of Syriac studies are considered under separate subject headings. Abstract: In response to an invitation by the General Editor, the paper reflects on the present state of Syriac studies as well as on the opportunities and challenges of the future. In addition to a brief discussion of the geographical changes in the worldwide presence of Syriac Christians and Syriac scholars, some suggestions are offered for work to be carried out in the coming years. The paper closes with some thoughts on the academic study of Syriac. Abstract: The term �Syriac computing� was coined in 1992 and took shape in 1995 when the First International Forum on Syriac Computing was held in conjunction with the Second Syriac Symposium in Washington DC. The term was applied to computer-related activities and projects which support Syriac studies. Syriac computing, however, began much earlier though on a small scale. On the 10th anniversary of Hugoye and the 15th anniversary of its parent Beth Mardutho whose contributions to Syriac computing is well know, this paper aims at outlining the history of Syriac computing, and giving some remarks for future considerations. Regarding personal computing, the paper mostly discusses the PC platform. The paper is arranged topically. ASSIMILATED TO THE BLOGOSPHERE: Matthijs den Dulk, graduate student at the Vrije Universiteit Amsterdam, has a new blog called NT Today, "A weblog on currents in the study of the New Testament and its world." JERUSALEM (AP) - Under heavy police guard, Israeli workers began a dig Tuesday at a centuries-old walkway that leads to a holy site disputed by Muslims and Jews, a spokesman said. Palestinians warned this week that work just outside the site, known as the Noble Sanctuary for Muslims and the Temple Mount for Jews, would inflame already high tensions. Muslims fear that Israel is planning to damage the neighbouring hilltop compound, the third-holiest site in their religion. Israel's Antiquities Authority said it is building a new pedestrian ramp leading up to the compound, which has been the scene of clashes in the past. The original earthen walkway was damaged in a snowstorm three years ago. Jesus of Nazareth obeyed kosher dietary rules and otherwise followed traditional Jewish codes of conduct — but within 20 years after his death, the Christian movement had jettisoned many of those laws. In Why Christianity Happened: A Sociohistorical Account of Christian Origins (26-50 CE) (Westminster John Knox Press), Mr. Crossley argues that that broad shift away from law observance was both a cause and an effect of the religion's rapid spread among Gentiles. SO is the title of Andrew Robinson's new book hyperbole? Of course it is. We all know that no one person can encompass all knowledge, that people who aspire to are nothing more than "Jeopardy!" freaks. But now and then, someone comes along who seems to have received several people's share of curiosity and insight and talent. Thomas Jefferson might be a good example. Nor are such fabulous beasts extinct: Consider the contemporary English polymath Jonathan Miller, who has excelled in comedy, medicine, the visual arts and television and opera direction. Born in England in 1773, Young grew up a Quaker but by early adulthood had rejected most of the group's puritanical tenets. He was a child prodigy. All the evidence indicates that he was reading by age 2. Nor were these picture books about duckies; his family reported that by the venerable age of 4, he had twice read through the Bible. Soon he was studying botany, zoology, languages, mathematics. With superhero speed, he absorbed the Greek and Latin that dominated university curricula at the time and on his own branched off into Syriac, Chaldee, Hebrew and Samaritan. "Chaldee" is an old term for Aramaic and "Samaritan" just means Hebrew as written by the Samaritans. Plus he nearly deciphered the Rosetta Stone. Not bad for a scientist. (IsraelNN.com) Exiled Hamas leader Khaled Meshaal, in a televised speech from Damascus on Sunday, warned that continued excavation in the “Al Aksa” area would lead to a new popular uprising. 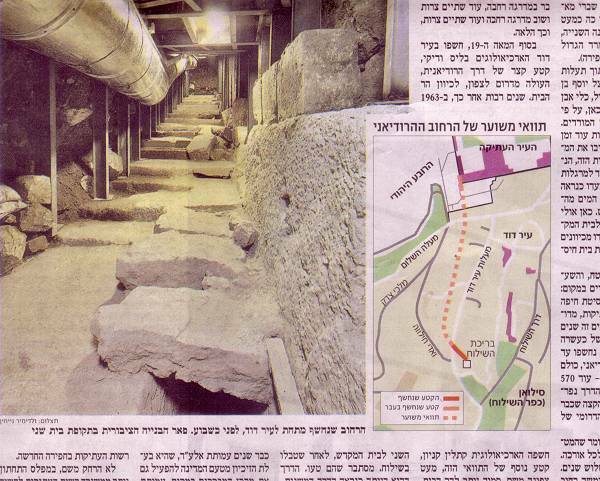 He was referring to the excavation of a Roman-era road stretching from the ancient City of David to the Temple Mount. Water used for Temple ceremonies was drawn from the Shiloah spring at the base of the city. The excavation of a tunnel under Jerusalem's City of David has gone on for months without a license from the Israel Antiquities Authority (IAA), as required by law. In addition, there is no operative plan for developing the site by the Israel Nature and National Parks Protection Authority (INNPPA), which legally administers the area. Nevertheless, no steps are being taken against the two IAA archaeologists who violated their license; instead, they are being allowed to dig in an area extending another 100 meters, to "explore" the site. The archaeologists, Professor Gabi Reich and Eli Shukrun, began the dig in the area of the village of Silwan a few months ago, following the discovery of part of a road that may have been Jerusalem's main street in the Second Temple era. The dig is being financed by Elad, an association that, inter alia, works to settle Jews in East Jerusalem. This is a very sensitive region for a dig. Should it approach the Temple Mount wall, it will certainly elicit angry reactions from the Muslim Waqf (religious trust), which has repeatedly accused Israel of trying to excavate under the holy places on the mount. Moreover, most of the excavation site is inhabited by Palestinians, and thus far, no effort has been made to get their permission, as required by law, for digging on and under their property. But on top of all that, it recently emerged that the dig violates the terms of the license that the archaeologists received in January 2006, and has not been approved by the INNPPA. I think you should sift a little more before reprinting potentially inflammable material. Enclosed map from another article in Ha'aretz this January 24 by Nadav Shragai. Thanks for that clarification. But it still sounds as though there are irregularities with this dig which are a cause for concern. UPDATE (8 February): Todd Bolen says that I've been led astray. Leif Carlsson, Round Trips to Heaven: Otherworldly Travelers in Early Judaism and Christianity. Lund Studies in History of Religions, 19. Stockholm: Almqvist & Wiksell International, 2004. Pp. 398. ISBN 91-22-02106-X. $99.50. This is the printed version of Leif Carlsson's dissertation prepared under the auspices of his adviser, Tord Olsson (Professor of Comparative Religion), at Lund University, Sweden. Carlsson (C.) addresses a common topic for the period between 200 B.C.E. to 200 C.E., one which is only partly correctly expressed by 'Round Trips to Heaven', because he also deals with other kinds of 'otherworldly' trips to locations that are often everything but heavenly. Basically, this monograph consists of two books in one volume: the first comprises heavenly journey texts that may be denominated as 'Old Testament Pseudepigraphy' (with the exception of 2Corinthians 12:1-5) according to the title of the classical two volumes edited by James H. Charlesworth and published in 1983, while the second is exclusively dedicated to 3Baruch ('A Journey into Death's Waiting Room') and could have formed a book on its own. Everybody who is interested in apocalyptic literature in general and in the specific motif of 'heavenly journeys' in particular will get a sound introduction to the most relevant texts. Profound knowledge in this field of research is not required, because the texts are presented in English only (except 2Corinthians and 3Baruch) and supplemented with introductory sections. Be that as it may and apart from some methodological inconsistencies, Carlsson's study is a significant contribution to the discussion of otherworldly trips in the Jewish and Christian literature of the period of time addressed. The review also mentions the online Arbeitshilfen für das Studium der Pseudepigraphen, which I had not seen before. It looks pretty useful, but it seems not to have been updated since April of 2003 and so is getting out of date. THE DEAD SEA SCROLLS get lots of attention in the Kansas City Star today in advance of the exhibit at Union Station which opens on 8 February. From Feb. 13 through May 8, some of the original Dead Sea Scrolls will be on display at Union Station. Kansas City should be immensely proud that it has qualified to exhibit these scrolls. What importance can they have for us today, given that they’re 2,000 years old? That is the question put to me during and after some 20 lectures I have given on the subject in the past few months. Within this brief space I shall try to summarize my response. The response is pretty accurate but needs some corrections and nuancing. Many of the parables of Jesus are contained in the religious writings of the scroll sect. The career of the group’s leader, whom they designated as the Teacher of Righteousness, eerily foreshadows the life and death of the founder of Christianity. No, none of the parables of Jesus are found in the Dead Sea Scrolls. And anything beyond the most general of comparisons between Jesus and the Teacher of Righteousness as ancient Palestinian Jewish teachers moves quickly into fringe ideas. 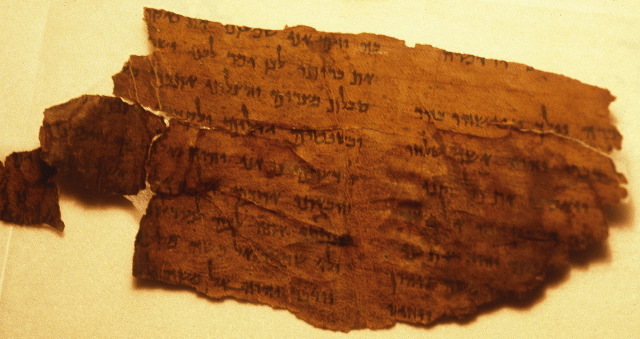 The Dead Sea Scrolls Hebrew Bible had been written more than a thousand years before. A close comparison of this Essene text with the 9th-century Masoretic text reveals virtually an identical rendition. Well, yes, some of the manuscripts are close to the Masoretic text and one or two are virtually identical, but a fair number of them have quite a few variations, often siding with variants known from the Septuagint Greek translation or the Samaritan Pentateuch. But these are only rarely matters of substance. The Essenes had clearly broken away from the political and religious leadership of the Holy Temple in Jerusalem. Their writings reveal a much more rigid observance of Jewish ritual than had prevailed in the Holy City. They set up their own sheltered and exclusivist community at Qumran, just northwest of the Dead Sea. They wrote their biblical and sectarian scrolls with great diligence. When in 66 of the common era the fury of Roman power was aimed at a besieged Jerusalem, the Essenes hastened to hide their writings in the nearby Caves of Qumran, some 10 miles south of the Holy City. Some version of the Essene hypothesis is probably right, but the degree to which the Qumran sectarians split from the Jerusalem Temple is far from clear. A serious split is implied by the Habakkuk Pesher. One can, but need not, read a split into the Community Rule. The Damascus Document assumes its readers will worship in the Temple, although perhaps not without reservation. And various liturgical texts (e.g., 4Q512) and calendrical texts give directions for worship in the Temple. The whole question of who used which calendar and where and when also figures into the problem. Relations with the Temple may have been better and worse over time; we really just don't know. Pages offer a peek at roots of faiths, and hope of profit for Union Station. has lots of quotes from biblical and Qumran scholars. is self-explanatory and is of interest to those who plan to attend. TEMPLE MOUNT WATCH: More fallout over those excavations. The Temple Mount will be closed to non-Muslim visitors on Sunday and police will restrict the entry of Arabs for the day, after Islamic leaders accused Israel of carrying out an excavation at the holy site, police said. The unusual weekday restrictions come after Muslim leaders calls on Arabs to visit the site en masse in response to Israeli excavation work near the Mughrabi Gate. RIYADH, Feb 3 (Reuters) - A Saudi-based body of Islamic scholars on Saturday condemned Israeli archaeological work near the al-Aqsa Mosque in Jerusalem, saying it was a "blatant violation" of the shrine's sanctity. "The most serious element is plans to excavate under the walls of the Aqsa Mosque and its underground tunnels," the Islamic Jurisprudence Academy said in a statement carried on Saudi state news agency SPA. Shmuel Rabinowitz, Rabbi of the Western Wall and Jewish holy sites in Israel, said there were no plans to excavate under al-Haram al-Sharif, known to Jews as Temple Mount. ENTER THE MESOPOTAMIAN UNDERWORLD ... IF YOU DARE!